Chop and drop in the vegetable garden, how to do it. 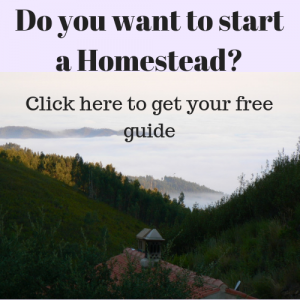 Home » Vegetable garden » Chop and drop in the vegetable garden, how to do it. Chop and drop is a way to create good soil in your garden for growing vegetables. In our vegetable garden I use green manure to chop and drop. It is less work than making compost and when applied right, it can bring the same results. So what do I do with chop and drop in our garden? And why? Covering the soil with the right thing. Different green manures that you can use. The way I use chop and drop is inspired on Masanobu Fukuoka’s way of growing a combination of white clover barley and rice. By closely observing what was happening in his field, he figured out a beautiful non tilling way of growing rice. He used white clover and barley straw to cover and mulch the soil so the rice had a better chance to grow in competition with the weeds. He also used ducks in the field to help, these animals would add manure to his system. It is this organic way of carefully observing and consciously playing around with mulching, chop and drop and manure that inspires me. It is the way I love to garden. Observe and play, observe again and continue until a system is working with just a little help. What comes out of these two incredible systems is that you can use material that is right at hand. Seeding green manure is not such a heavy job, especially when your soil is already tender after having used chop and drop. It surely takes less effort than getting in forest soil or making compost. Another thing is both systems work with layers of organic material. Used consequently this approach will lead to a soil that is similar to a forest soil. It will be rich in humus. It will also create the right circumstances for fungi and bacteria that will make nutrients available for plants. And last but not least, it is a no till system. This is important. I don’t want to say that tilling is always bad. There are good, non deep, tilling systems in combination with green manure as well. But for this system it is important not to till. By doing so you would destroy this type system. What is also an advantage is that the soil is permanently covered. Again this creates the optimal circumstances for organisms like worms, bacteria and fungi to grow because it regulates the soils temperature and prevents the soil to get too dry. Gardening, for me, is trying to create the right circumstances to grow vegetables. That means the circumstances in the soil have to be optimal for microorganisms and animals that improve the soil. Animals like toads and worms. That is why I am more focused on the condition of the soil than on the plants. I think that when the soil conditions are right and plants are seeded or planted at the right time in the season, they will grow well. Creating good functioning living soil is key to gardening. Using compost could be part of this system too. And in our case it is. The only problem is that I do not always have enough compost to use compost alone. It is hard work and time consuming too, to make it. Chop and drop is a bit less heavy work and it also brings humus into the ground when you keep on doing it layer after layer. This means I can sometimes skip the compost. Which means I can use less compost, which than will save me some work. When done at the right time you can even add layers of animal manure. You could combine this with the right crop rotation. So plants that can take fresh manure are planted in the plots where you have used fresh manure. This way you could completely skip the compost making. Or just make one yearly compost pile for the weeds. Because there is either plants growing or chop laying on the soil, the soil is always covered. This is also important for the microorganisms that are living in the soil. I do not use weeds for chop and drop. Some weeds grow to big and to woody. Others are too invasive. Grass is very competitive to the vegetables that I want to grow so I don’t want these either. Having said this, there are some weeds you can use for chop and drop, like chickweed. You do need to know what you are doing here, just using any weed can produce a lot of work, as I have seen in some veggie gardens. In stead of using weeds I chose one of my favourite green manures, like fodder fava beans. These plants grow very lush in our sandy soil garden. They produce a lot of green mass. Another reason I chose these fodder fava beans is because it is a nitrogen fixer. It will fix nitrogen in small blobs on the roots. By chopping the fava bean plants I leave the nitrogen blobs with the roots in the soil, so whatever grows after the fava beans can use the nitrogen that is fixed in these blobs. I seed the fodder Fava beans in rows. I have 2 reasons for seeding in rows. One is that I do know where they will grow and so I also know where I can do some weeding. I do some weeding in the first weeks when the green manure is growing so it gets a good go ahead of the weeds. At a certain point I stop weeding because the plants get lush and cover the ground and the weeds get no light to grow. The second reason I seed the fodder fava beans in rows is that I use drip irrigation. The fava beans are seeded along the line of the irrigation dripping pipes, so I am sure they get enough water. I carefully chop the fava beans when they are just flowering. Right above the root on the soil level. You can chop them earlier as well, but make sure you have enough green mass to cover the soil when you drop it. After chopping I organize the greens between the rows so it covers the soil like a mulch. It is the end of April now. After having chopped the fodder fava beans, in my summer crop plot, I will seed three rows of buckwheat in the fava bean mulch. This will be a second green manure before the summer crops go in. I do this because I need to keep the earth covered until the bell peppers, courgettes and eggplants are big enough to be planted. I will chop and drop the buckwheat where the courgettes, aubergines and bell peppers are going to be planted, the rest of the buckwheat I will leave. When the plants get bigger I will make some more space for the plants by chopping and dropping more buckwheat. My hope is that the buckwheat will flower by the time the summer crops are also flowering. Buckwheat attracts a lot of small insects that are good for pollination and also for pest control. The latter is why I use buckwheat in this case. 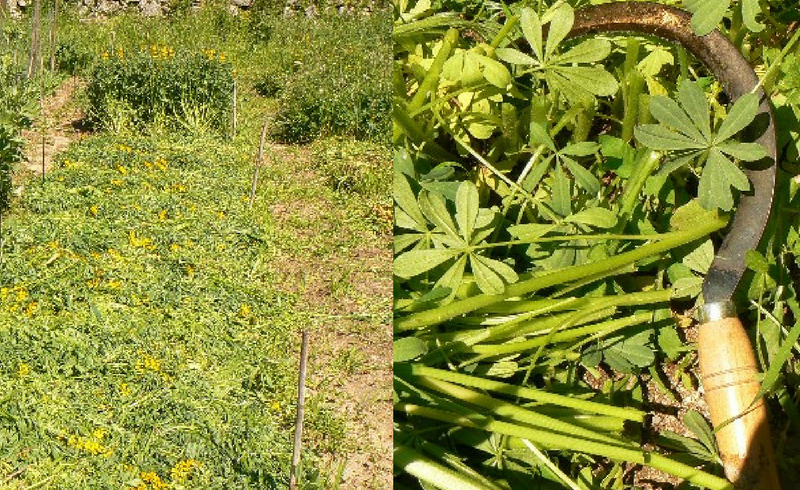 Different green manures have different characteristics. Which one you chose depends on the effect you want to achieve. I use oats for a better soil structure because it makes a lot of tiny roots. Incarnate clover and fodder fava beans for the nitrogen fixing. Serradella for a good ground cover and buckwheat for attracting useful insects. You can use them all for chop and drop. You can also use vegetables like mustard or spinach for chop and drop. There is a german companion planting system that starts with seeding spinach in rows that are 50 cm apart. Between the spinach other crops are sown or planted. Some spinach is consumed, the rest is used for chop and drop between the vegetables. I have used it for a while when we were still living in Holland. There it worked very well. Here in the south of Portugal the spinach does not want to grow so well so I use different systems now. There are more ways to use chop and drop. As we go through the year I will describe some more ways to use this method. In the summer when the sun is battering the soil I use green manure to protect seedlings. 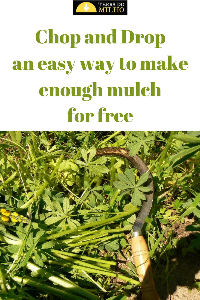 When the green manure gets too big and the seedlings are small strong plants, I use the chop and drop as a way of mulching the small plants with the green manure chop. In spring I plant the seedlings directly in the fava bean rows. Keep an eye on my blogs, there will be more information on this topic. I am happy the chop and drop worked for you too. It does enrich our soil as well. We also use the chop and drop on our garden paths when we have to much chop. It draws in rain worms and they will spread the good earth under the paths into the beds. The other things we found that the chop and drop works very well in the tomato beds. When the tomatoes hang down they will settle on the mulch and not rott away so quick.